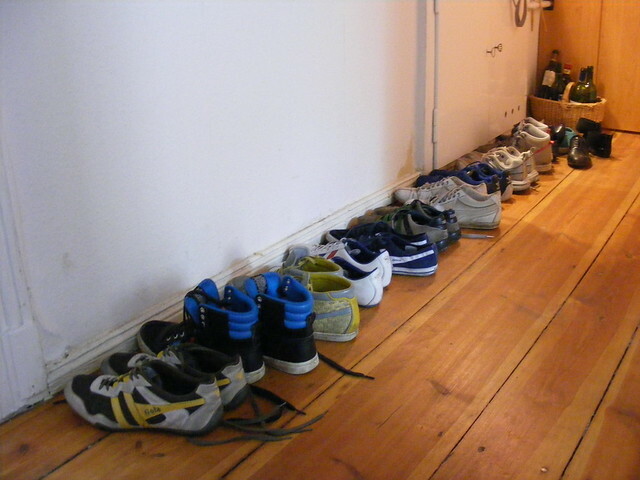 We know that Finns remove their shoes and footwear when they enter a house. Like this, they avoid bringing snow into the house that will eventually turn into dirty water puddles. This mere practical thing turned into a habit with time, and now they feel more comfortable without street footwear when they are indoors. But that doesn’t mean that they go barefoot or with socks, necessarily: They also use house slippers or home shoes. All shoes remain by the door. One of the Finnish customs is to remove one’s shoes when entering a house. But anyone who has done that during a time of the year that wasn’t summer in Finland knows that your feet can get cold very fast. In order to avoid that, you can do plenty of different things: fill your house with rags or carpet, or wear thick socks – for instance made out of wool – over your normal socks. You can also have a different pair of footwear for indoors (that’s my preferred solution: Because in Spain there is no tradition of taking the shoes off, I just wore different ones when I was home and the snow could melt by the door, over some paper towels). Or you can wear house slippers. There is also a “business version”, which is wearing leather sandals over the socks. This can be seen widely in Finland. For instance, when I was going to the uni in my Erasmus year, plenty of teachers took off the street footwear and put on the leather sandals. 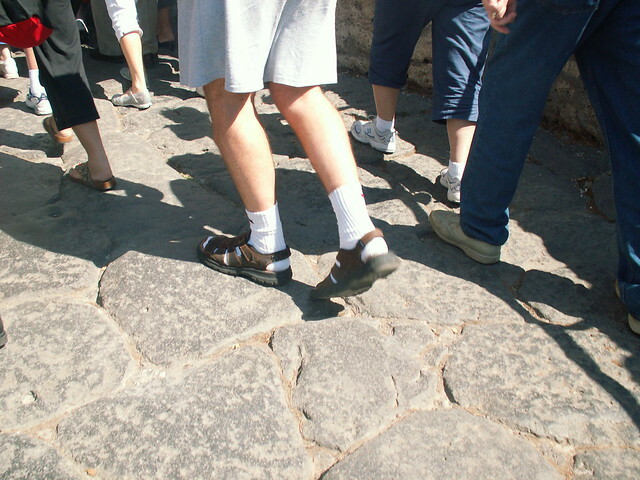 Sandals over socks: a pretty big “no-go” in Spain that in the North of Europe is accepted as formal. Jokes aside, “who cares what people think, who cares what people say”. Being cold in Winter is one of the worst things that can happen to anyone. And with a winter that can reach -32 degrees Celsius (my personal record), it is something not to be taken lightly. Reino is the brand that is on top of this interesting market – who knew – of Finnish house slippers. It is the modern, hipster choice in Finland. The Reino slippers have been produced since 1932 in Tampere, keeping their original style since then. The house slippers brand has since then resisted wars, economic depression, crisis and globalization, up to today. At some point in their history, they even took their entire production to third-world countries to reduce costs. But one given day the management decided to sell the company due to low sales and the workers bought it. They restored the machines and started the production again in Finland. 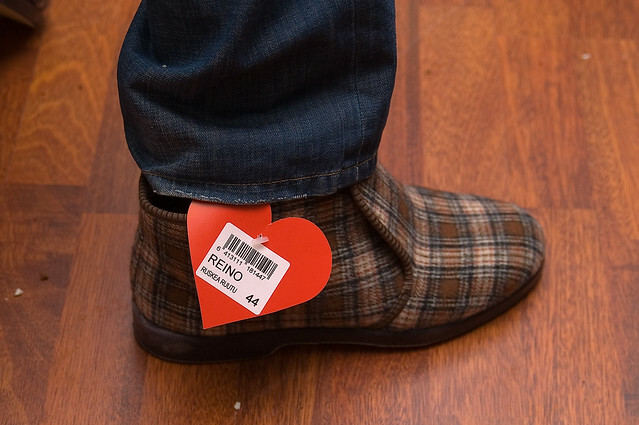 Nowadays this brand is back as a hipster, iconic way to dress your feet for the home. I am pretty sure that its grandpa-look, sitting on the sofa with a robe, smoking pipe and newspaper had a lot to do with its success. This is their Online Shop, if you want to join and wear some house shoes that seem to say “homey, but elegant”. Also worn in a totally ironic way. They are so popular in the country that even the beer brand Olvi made a special edition of its beer with the classic pattern of the Reino shoes. The name: “Olvi Reino”. You can see it here: en este enlace. Classic. Long-lasting. What do you wear on your feet in Finland, when you are home? Did you know the Reino house shoes brand? When do seasons begin and end in Finland? I am barefoot ALL YEAR at home, basement floor and garage floor. Even go outside barefoot to fill the bird feeder in the Winter.